Several national surveys now contain a set of standard disability questions. These surveys have been used to develop profiles of people with disabilities living within their states. Some states, such as Iowa, Montana, and Oregon, have included emergency preparedness questions on the Behavioral Risk Factor Surveillance System (BRFSS). Emergency Preparedness among Oregonians with Disabilities Cdc-pdf[688 KB, 2 pages]External: In order to assess the status of emergency preparedness for people with disabilities in the state, the emergency preparedness module was included in the BRFSS in the year 2013. For optimal participation, the module was administered through both landline and cell phone surveys. The module defined an emergency or a large scale disaster as an event that has the potential to isolate or displace a person from his/her home for at least 3 days. Oregon compared responses of people with and without disabilities for each of the 10 questions in the emergency preparedness module and prepared a fact sheet with key findings and recommendations. 2016 Annual Report on the Health of Oregonians with Disabilities Cdc-pdf[483 KB, 81 pages]External: Oregon Disability and Health Program used data from the 2014 BRFSS to create this report that includes results of questions on emergency preparedness. States have used registries to identify and locate people with disabilities by asking them or their caregivers to voluntarily enter information into a registry such as Smart911External, designed to identify individuals who may require special assistance during emergencies. Smart911External is a secure, national database supported by fees paid by public agencies. The services are available to anyone, but is especially of value for individuals who self-identify as having special needs. Emergency response personnel use this information to make better decisions and improve response time, and municipalities can sign up for advanced services that enables them to know who lives in their community that might require additional assistance in the case of an emergency. Several Disability and Health programs around the country are now encouraging people with disabilities to sign-up for Smart911External or similar registries. and add what you want responders to know in case of an emergency. 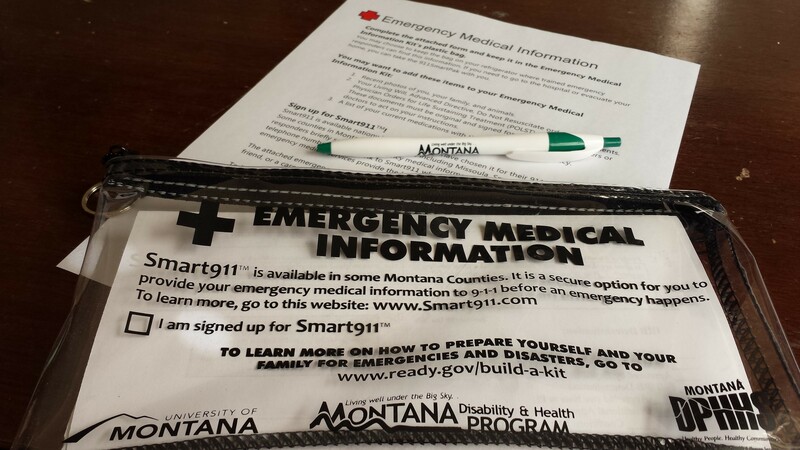 Emergency Medical Information (EMI) kitExternal: The Montana Disability and Health Program created this kit to promote awareness of Smart911External and to offer support for people with disabilities who may need help creating their profiles. The kit materials include an Emergency Medical Information form Cdc-pdf[375 KB, 9 pages]External, a plastic bagExternal to keep the form safe and let responders know the person has signed up for Smart911External, and a magnetic hook. People can keep the bag on the refrigerator where trained emergency responders can find it. They also can take the bag with them if they need to go to the hospital or evacuate their home. Assent form for adults with intellectual disabilities Cdc-pdf[332 KB, 5 pages]External: Montana also collaborated with partners to develop this form that explains Smart911External in plain language for use in service and supports planning. Rhode Island Special Needs Emergency Registry (RISNER)External: This registry is designed to identify individuals who may require special assistance during emergencies, such as people with disabilities, long-term medical conditions, like diabetes, heart disease, and epilepsy, and other special healthcare needs. The information submitted to the RISNER is shared with local and state first responders and emergency management officials. The Department of Health and Rhode Island Emergency Management Agency have worked with E-911External to notify first responders when they are responding to a household that may have someone enrolled in the state registry. Several states have conducted their own surveys or use state-specific data sources to determine the needs of their population with disabilities and their caregivers. Emergency Preparedness for Alaskans Experiencing Disabilities Cdc-pdf[375 KB, 28 pages]External: This is a report of a survey conducted by the Alaska Health and Disability Program. Adult Alaskans experiencing disabilities or their adult caregivers were asked to participate in this anonymous survey to establish a baseline measure for emergency preparedness statewide and to gather data for developing and providing resources. A second 2014 follow-up needs assessment Cdc-pdf[830 KB, 30 pages]External was conducted the following year to measure progress. Montana State, County, and Reservation ReportsExternal: Montana Disability and Health Program brought together data from the American Community Survey, Montana Vital Records, Medicaid, Homeless Survey, US Census Small Area Survey, KIDS Count, Women Infant and Children, and the Home and Community Based Services Waiver program to provide a comprehensive picture of disability for each county in the state. You can visit the Montana Disability and Health Program website to find these state, county, and reservation reports.